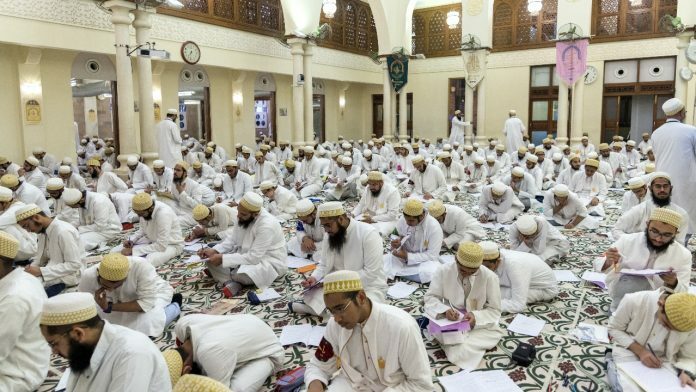 Aljamea-tus-Saifiyah’s al-Imtihān al-Sanawī, (annual examinations) are now well underway in Surat. Each year the examinations commence with a discourse by His Holiness Dr Syedna Mufaddal Saifuddin TUS know as zikra (remembrance). The discourse is attended by faculty and students of the four campuses of Aljamea,ʿummāl, (regional representatives of His Holiness) kidmatguzars, (those who serve the Daʿwat in various capacities) and members of the Dawoodi Bohra community from all over the world, and sets the tone not only for the ensuing examinations but also the following academic year. Examinations are commonplace in any academic institution, but the examinations at Aljamea are unlike any other. There is an age old saying in Arabic which captures the essence of conventional Imtihāns (examinations): It is by means of examination that a man is either exalted or belittled. At Aljamea however, the philosophy of al-Imtihān defies this convention. At Aljamea, it is by means of al-Imtihān that a man is exalted and never belittled. Following the conclusion of zikra, each student is provided with a preamble booklet in accordance with their level of study as per the four stages of academic progression in Aljamea. The booklet, inspired by the discourse, contains material which aids students in better understanding the discourse and informs their response to questions. The written examinations are accompanied by a viva voce which is presided over by His Holiness. The four rectors of Aljamea conduct the viva voce examinations, where students from class seven to eleven are called individually or collectively to recite excerpts from the Risāla Ramaḍāniyya. The Risāla is an epistle composed by al-dāʿī al-mutlaq (head of the international Dawoodi Bohra community) each year containing an introduction in the style of literary prose, followed by a philosophical body of writing in keeping with the central theme of the epistle and finally a recollection of the notable events of the year. The epistle is in traditional classic Arabic and students are required to recite an excerpt from it and thereafter render an understanding of the text in the community vernacular Lisān al-Daʿwa for the benefit of the listeners. Students are then asked questions based on the excerpt where they are required to relate their answers to various other texts and disciplines as well as to their own thesis and contemporary issues that affect the community. Insightful comments and observations by the rectors, as well as occasional sought after remarks by His Holiness, make for an overall captivating exchange, with the audience sitting for more than three hours each day in keen interest. In the Risāla authored by His Holiness TUS last year: Jāmiʿat thamarāt al-ūlūm (a compendium of the fruits of knowledge) he gives invaluable insight into the tradition and philosophy behind al-Imtihān al-Sanawī. The Imtihān is a necessary precursor, as it examines and evaluates an individual before an ascent to a higher level of piety and understanding. When Syedi Hasan bin Nuh QR asked Syedna Hasan Badruddin’s RA permission and blessing to begin studying the advanced disciplines of tāʾwīl and haqīqa (esoteric and philosophical understandings of the Holy Quran and other Ismaʿlī Tayyibī texts reserved only for those with special permission) Syedna RAresponded by saying that only those that have undergone al-imtihān can be permitted. Much like the numismatist who closely examines gold coins with a gavel, or the goldsmith who determines the purity of gold, so does the dāʿī appraise the students at Aljamea as well as every member of the community, and elevate them. The Imtihān al-Sanawī undoubtedly serves as an intellectual renaissance and a practical rejuvenation for the entire community. Questions are answered, doubts are cleared and members of the community return to their homes prepared for the year to come. As for the students of Aljamea, the end of al-Imtihān marks the beginning of an anxious wait. The Imtihān al-Sanawī are examinations after all, and the natural concomitant to all examinations are the results.